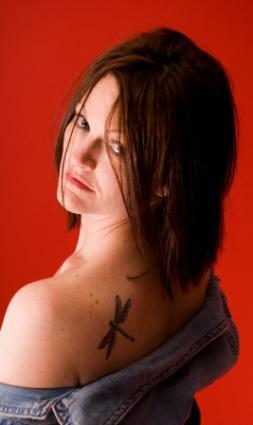 There are many creative ideas to consider for a dragonfly tattoo. A dragonfly design can be bold and colorful or simple and subtle. With a wide variety of possibilities, a tattoo featuring a dragonfly can hold a special meaning to the person getting one inked, reflecting the individual's personal style and personality. 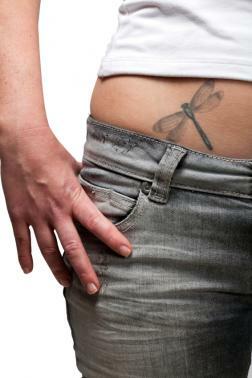 Realistic: A tattoo designed to look like an actual dragonfly is a popular choice. With proper shading and true depiction, the tattoo can look as if a dragonfly has landed on your skin. Fantasy: Dragonflies can be drawn to look mystical. If you decide on a design from the realm of fantasy, you can use abstract ideas and bold coloring such as purple, pink and green. Patterned wings: Instead of using realistic wings for your tat, consider making your dragonfly's wings the showcase of the piece. Think about psychedelic colors and unusual patterns. Fill the wings with tiny hearts for a "love bug". Consider a paisley pattern for something truly unusual, or go with stripes, polka dots or plaid to express an offbeat character. 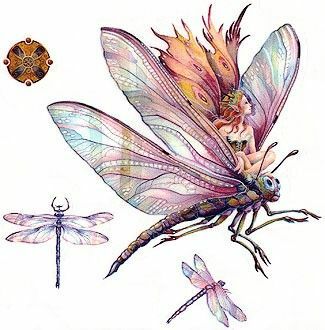 Dragonfly fairies: Keep the wings, but replace the insect body with a beautiful, slender fairy body. 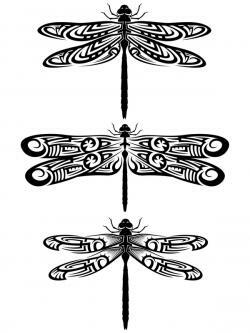 Tribal: You can use the bold lines and slashes indicative of tribal tats to create the representation of a dragonfly, or you can use the typical insect design as the centerpiece in a tribal motif. 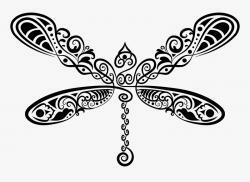 Although women love tribal tats too, this is option is suitable for anyone seeking a more masculine design idea for a dragonfly tattoo. Scrollwork: The dragonfly's elegant lines make a wonderful subject for a scroll-style tattoo. The wings can be drawn as a series of loops, with smaller scrolls for antennae. You can even use wandering scrolls to show your dragonfly's flight pattern. 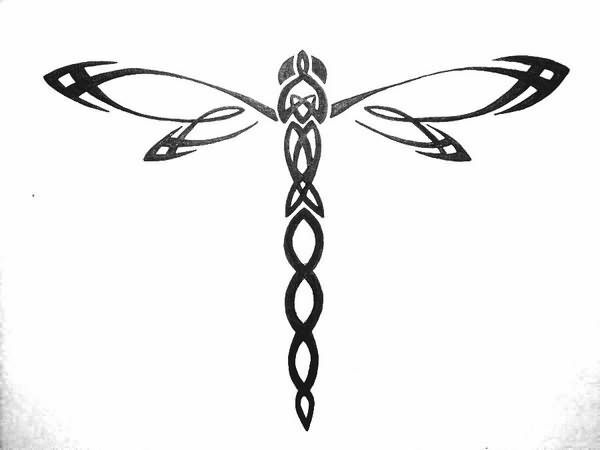 Celtic dragonfly: Like scrollwork, the never ending knots of a Celtic style tattoo can be fashioned to resemble a dragonfly. This is another design choice that is easily adapted for men and women. Flower vines: A tattoo showing one or two small dragonflies hovering along a delicate green vine dotted with blossoms is ideal for the wrist or ankle. Roses: Roses are always a favorite, but they look especially nice when accompanied by a dragonfly with silvery wings. Grapevines: Similar to flower vines, a scrolling grapevine looks pretty winding up the leg with a dragonfly landing on it somewhere along the way. Cherry blossoms: A dragonfly amongst a branch of cherry blossoms could make a lovely chest or back mural. Text: Consider enhancing your dragonfly tat with meaningful text. For example, you can add an inspirational quote, a line from a poem, initials or a significant date. Dragonflies can symbolize a range of emotions and meanings. They often are used as a symbol of freedom and rebirth but are also used as to represent good luck, strength, peace, harmony and even purity. Dragonfly tattoos can be as unique as the individual who chooses to get the design inked onto their body. Dragonflies are beautiful creatures that can be used as a spectacular tattoo design that will attract attention and hold a special meaning to the wearer.